Martin Garza from KERI-AM 1180 served as Master of Ceremonies at the Labor of Love Banquet (in addition to providing some impromptu translation for the Spanish-speaking attendees). Listen to an excerpt from Martin's welcome. "The work that you do should be shouted from the rooftops!" Listen to an excerpt of what Stephanie said. Sharon Johns, LSM co-founder, also shared briefly at the banquet. Orthella's son Daniel was one of the first fruits God produced through this ministry. Daniel is now 19! 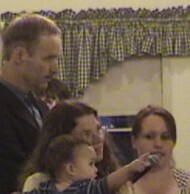 Listen to part of what Orthella said and praise God with her. Candy's voice broke as she thanked the Lord for LifeSavers Ministries: "these people have done very beautiful things for many people... my joy is my daughter." 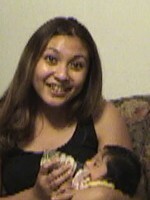 Listen to some of what Candy shared about her appreciation for the life of her daughter. "This event was absolutely wonderful -- so moving. Thank you." Zhou was incarcerated for over five years by the INS because she wanted to escape from forced abortion in China. Zhou's story (and the story of Zhou's daughter Mary) was shared by video at the banquet. Watch our short video on Zhou and Mary. Listen to some of Tim Palmquist's comments on what God did in the Chinese refugee ministry. Gary Giumarra talked candidly about the struggle he experienced when he first began supporting LifeSavers Ministries. "This is such a worthwhile ministry. I think all you have to do is take a look in the face of one of these beautiful children who are here tonight." Listen to an excerpt from Gary's talk. Thank you to our Labor of Love table sponsors! Special Thanks to all our moms, and their children, who had the courage to share their stories with us. We really do love you. "Thank God for this special night to honor God and bless the mothers, fathers and children!" 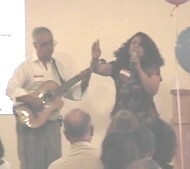 Betty Casillas sang a song she wrote entitled "Teach My Mother, Oh Lord." The song touched the hearts of the young women attending the banquet whose children were saved from abortion. Listen to an excerpt from Betty's song (in Spanish) and read the lyrics (in English). Jackie was shy at first, but she once she started bragging about her son Jordan she didn't want to stop. Listen to some of what Jackie had to say about Jordan. 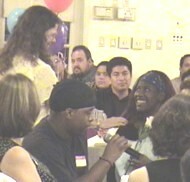 mothers in saying "thank you" to those who helped to save their lives at the Labor of Love Banquet on June 17, 2004. 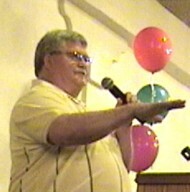 Within minutes after the banquet was over, we began receiving requests for recordings of this event. This page shares some photos, video excerpts, and audio recordings of the highlights of the evening, along with comments from those who experienced it. Regrettably, a complete recording of the evening may not be possible, because some portions were apparently not recorded (if you have any recordings or photographs from the banquet, please share them with us). The Labor of Love Banquet was planned to celebrate the twentieth anniversary of LifeSavers Ministries. About 250 people joined in the celebration, including all of the founders of LifeSavers Ministries along with those who lead the outreach today. "...a young man named David armed only with a sling-shot stood and faced down a giant named Goliath and he said, 'Is there not a cause?' If ever there was a cause, this is a cause." Brian and Janel thanked God for using LifeSavers Ministries to save the life of their son Jaiel--and Jaiel himself even had quite a bit to say. Listen to part of what Janel and Brian (and Jaiel!) had to say. of a child. If only women who enter the abortion chamber every week could have their eyes opened to this truth. Watch our 30-second video on Tracy and R.J. Listen to Terri pleading last October to save R.J.'s life. LSM co-chairman Tim Palmquist encouraged the parents whose children were saved, emphasizing God's plan for each one of these children. "I want you to feel the destiny that you're holding in your hands," he emphasized, reminding them of the fact that in biblical history the devil furiously schemed to try to destroy the children who had a special purpose in God's plan. Tim then talked about how God has revealed His plan through his own family. "Even though neither of us has ever been a part of an abortion experience personally, we've felt it," he explained. "I think we've felt what you ladies feel." But through a series of unplanned pregnancies, God's plan became evident. Too many children? The Tim and Terri Palmquist family. Listen to the music to Terri and Tim's song "Too Many Children?" (and read the lyrics, along with some additional comments about the song). Tim then shared a brand new song, written by Terri and himself over the past couple of years, called "Too Many Children?" The song relates the feelings of despair which an unplanned pregnancy can trigger, but then considers how God's glory is magnified through each unplanned pregnancy just as it is magnified through every flower. Throughout the song, Tim and Terri's children presented Terri with flowers, until at the end of the song she was holding a full bouquet. Looking into the eyes of so many children who were saved from abortion was a bittersweet experience for Tim. He compared his feelings to those of Oskar Schindler at the end of the movie Schindler's List. "I could have got more out," Schindler sobbed, "and I didn't." If only we could see how our actions today stand from the perspective of eternity. 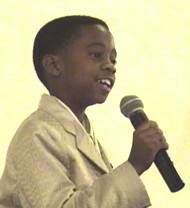 Jordan Young, a child who was saved from abortion, touched everyone's hearts, moving many to tears, when he sang "Thank you for giving to the Lord, for I am a life that was saved. Thank you for giving to the Lord; I am so glad you gave." Listen to a portion of Jordan's rendition of the Ray Boltz song "Thank You" and read the special lyrics adapted by Tim and Terri Palmquist. Watch our "Jackie and Jordan" video (not presented at the banquet). "It was wonderful! Jordan's song was the highlight!" But Itzhak Stern challenged Oskar Schindler to focus on the lives that were saved, and to understand that "there will be generations because of what you did." And so, we also thank and praise God for every child (and every young adult) who was saved from abortion over the past two decades of LifeSavers Ministries' efforts. We declare in faith that God has planned for these children to become a key part of the battle to dismantle the abortion industry in America, until we return to our founding fathers' principles of recognizing the gift of the unalienable rights our Creator so graciously endowed upon us. To take a stand with us in this effort to rescue America's heritage, click here. To find out how to get involved financially in this ministry click here. "This has... brought me closer to an issue I have always felt very strongly about... now I feel I should invest in the battle personally and not just with voting." On March 16, 2005, Leon F. Brown, an attorney with Clear Channel Television (owners of KGET-TV 17), wrote a letter to LifeSavers Ministries. The letter expressed concern about "content on your LifeSavers website referencing one of our employees and one of our television stations." "Please be advised that this is a formal demand for removal of all information relating to our television station from your website as we believe that information to be defamatory. In addition we request a retraction of that defamatory information currently posted on your website." 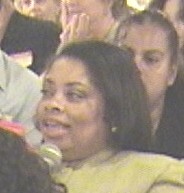 For the record, the information which previously appeared here was never intended to defame KGET-TV 17 or any of their employees, but to honor the courageous women who told their stories at this banquet, and to affirm the fact that the stories of these women and children who stood for life in the midst of our culture of death are newsworthy. 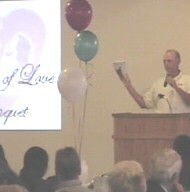 This page includes links to audio and video excerpts from the Labor of Love banquet (in addition to links to other pages). To listen to an audio excerpt, click on the speaker symbol. Fr. 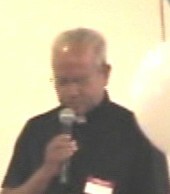 Chummar from Our Lady of Guadalupe opened the banquet with a prayer about grace, love, glory and life. Listen to an excerpt from Fr. Chummar's prayer. "Thank you so much for this beautiful experience...."
Attorney Steve Hanson, co-founder of LifeSavers Ministries and the Bakersfield Pregnancy Center, talked about the spiritual warfare experienced by the early LifeSavers, and encouraged banquet attendees to read Tim Palmquist's book. "If I could have written a book about the sidewalk ministry... this is the book I would have written. This is the best I've ever seen." Listen to a portion of Steve's comments. Lewis Ament received a special award at the banquet. "Lewis Ament laid the foundation for this ministry through his prayers," Tim Palmquist explained. Before LifeSavers began, Lewis began walking and praying on the sidewalks outside the abortion chamber, and he has continued to do so throughout the past two decades. As a token of appreciation, the leaders and founders of LIfeSavers Ministries presented Lewis with a new pair of shoes. "He's worn off a lot of shoe leather over the years," Tim joked. Lewis was literally speechless. Kim traveled all the way from Bishop to Bakersfield to express appreciation to LifeSavers supporters for the life of her daughter Jocelyn. "You guys saved my life thankx!" Jessica talked about how God has saved and healed her children as Terri Palmquist held Matthew, Jessica's son who was saved from abortion. Andrew, Jessica's youngest child, was still in the hospital on the day of the banquet, but he is now home, a living testimony to the healing power of God. Listen to some of what Jessica said about how God has used this experience in her life. Read more about how God has been displaying his glory in Andrew's life. Tim Palmquist, LSM co-chairman, challenges parents to recognize God's plan for their children, saying "I want you to feel the destiny that you're holding in your hands." Listen to some excerpts from Tim's comments about how unplanned pregnancy is used in God's plan for His glory. "Thank you Tim and Terri for tonight and for all your love and sacrifice over the years." The parents of children who were saved from abortion joined their children in standing with Jordan Young at the close of his song "Thank You," and they joined the banquet participants in giving Jordan a standing ovation. Listen to the comic relief Martin Garza provided after Jordan's song. 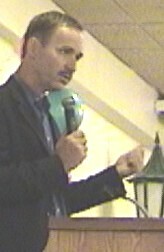 Harold Bryan, pastor of In Jesus' Name, closed the banquet with scriptural insights and prayer. "This is a God thing, and God's love is here tonight." Listen to some excerpts from what Pastor Bryan shared before the closing prayer (our battery ran out before the prayer, so we didn't get it recorded).